Thank you for visiting and welcome to our website, here at www.boxingtraininggear.co.uk we provide you with detailed reviews and comparisons on various boxing equipment. We also provide tips and guides on the best boxing exercises and how to get the most out of your workouts. We target anyone who’s into boxing training of all levels, whether you’re just thinking about getting into boxing training, just started boxing training or already experienced at boxing training. You don’t even have to have any interest in boxing to be honest, the workouts itself can be used just to improve your fitness. You haven’t got to box competitively or even be a member of a boxing a boxing club to benefit from the content on this website, you can even be someone who just wants to add a little bit of boxing to your current workout. Boxing training is exercising and we all know exercising has numerous benefits, but the word exercising is a bit vague as it can vary from a basic light workout consisting of a few push ups and sit ups or it can be a very intense workout where you’re on the verge of passing out. When people hear the words boxing training, most would probably think it consisted of a very tough and intense workout that you have to be super fit to do, but this is not the case at all. Boxing training also varies and can be a very light to very intense workout. Self-defence – This is the main reason why most people take up a form of martial arts, boxing will not only teach you how to attack but it’ll also teach you how to defend yourself. Better coordination – Boxing requires tremendous coordination, and by skipping and doing bag work you’ll only improve your coordination. Increased stamina – Most boxing workouts will require some form of cardio and you’ll tailor the workout according to how fit you are which will in turn increase your stamina. Increased power – Once you grasp the correct boxing technique your power will naturally follow, this ties in with having better coordination because enabling your body to execute a punch in one smooth movement requires good coordination which will in turn generate more power. Confidence – Just like in the same way lifting weights or losing weight increases your confidence, boxing training can make you look better, feel fitter, feel stronger and lose weight which will overall make you feel more confident. Skipping rope – Pretty much a must have, skipping improves your fitness, coordination and footwork. They are also cheap and affordable so there’s no excuse for not owning one but if you’re a beginner at skipping it can be frustrating learning the ropes! 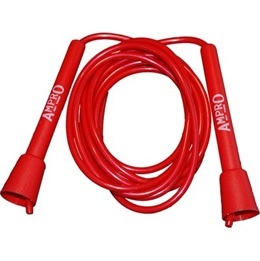 See our top 5 skipping ropes. Hand wraps – Your hands and your wrists contain loads of little bones which can be quite fragile, therefore wrapping up your hands nice and tight when doing any bag work will protect your hands and wrists from potential damage. 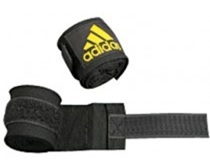 Check out our best rated hand wraps. Boxing gloves – Another essential item you need, for training heavier gloves is more ideal as this also gives extra protection. 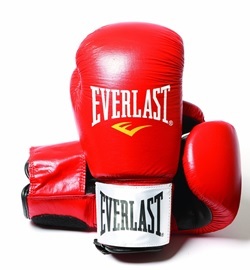 Men should be using at least 14 ounce gloves and women 12 ounce gloves, you can see what gloves are the most suitable for you by checking out our best men’s boxing gloves and best women’s boxing gloves. You should own and use your own gloves, it’s not really hygienic to use other people’s gloves and definitely do not use boxing gloves that belong to a gym or boxing gym as it’ll contain other people’s dirt, sweat and bacteria. Boxing boots – Not a must have unless you join a boxing club they’ll probably require you to own a pair. Boxing boots do make your movement smoother when you’re doing bag work, if you choose not to wear boxing boots for bag work then wear footwear that’s light and comfortable and that’ll allow you to stay on the balls of your feet. 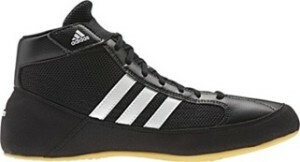 Skipping in most trainers and running shoes can be quite difficult, other than boxing boots the best footwear to skip in would be trainers which has a flat sole. Alternatively you can see our best boxing boots. 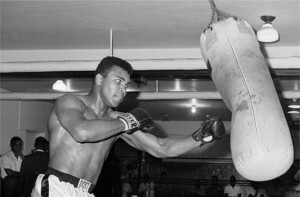 Heavy bag – A heavy bag is great for practicing combination punching, working on power and technique. Be careful not to fall in love with power when using the heavy bag, this usually leads to bad habits and abandoning basic boxing techniques. If you’re fortunate to have enough room in your home or garage then see whether any of our top 5 heavy bags can make the room or garage look even better. Free standing punch bag – Free standing punch bags tend to be lighter and not as durable as a hanging heavy bag, however with a free standing punch bag you’re not as restricted to where you can place it and won’t need drill any holes in the wall for the bracket or purchase a big frame to hold your heavy bag. You can work on movement and combination punching on a free standing punch bag but you just can’t put too much power in otherwise the bag will move too much or even tilt over. 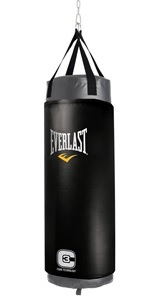 Check out our top 5 free standing punching bags. 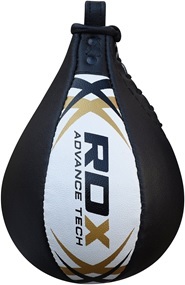 Speed ball – This is used to improve hand-eye coordination, punching accuracy, rhythm and speed, but if you’re only boxing to keep fit then a punch bag is a priority over a speed ball. A speed ball also needs to be mounted to the wall so the ball is slightly above eye level or you can buy one which is attached to a free standing frame. See our best speed balls, so you can decide whether you want this as well as a punch bag. Pull up bar – Training using your own bodyweight will get you in better shape than lifting heavy weights! When it comes to bodyweight training, pull ups if not the best, it’s definitely one of the best and most effective ways to build your back muscles. 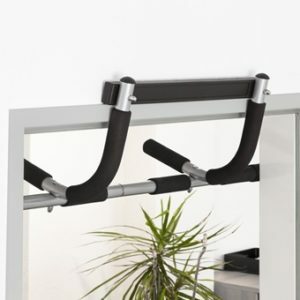 There are a few different types of equipment that’ll allow you to do pull ups, and the prices are also very affordable. Although a lot of punching power is generated from the legs, having powerful lats and traps will contribute towards your overall punching power! 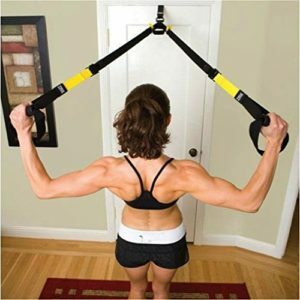 Suspension trainer – Another great way to train using your own bodyweight, this portable piece of equipment can be taken absolutely anywhere with you and it can simply hook onto a door so you can train whenever you are! Used by athletes and the U.S. Military a suspension trainer allows you to do a wide range of exercises that’s suitable for people of all fitness levels. If you choose to get a different brand rather than the original TRX brand, then you can pick one up for pretty cheap without losing out on quality. Agility ladder – Combine this with skipping training and you’ll notice great improvement in your agility, speed, coordination, cardio and footwork. 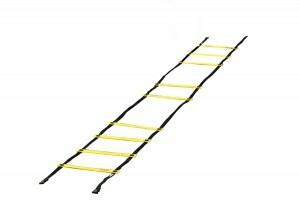 Agility ladder training for boxing is probably underutilised as some people believe skipping will cover the same areas an agility ladder would. The benefits you’ll gain from using an agility ladder are similar to those you’ll gain from skipping but there are some areas agility ladder training will cover that skipping won’t. Check out the benefits of agility ladder training and you’ll see why it’s worth getting one.